Every so often it becomes necessary to repaint the exterior of your home or office. After years of wear and weather damage even the most high-quality paint will begin to crack and fade. When this starts to happen it is crucial to act quickly, as the paint on the exterior of your home does much more than simply make it look nice. Exterior paint actually protects your home from adverse weather, water damage, and many other issues. So, if you notice the paint on the exterior of your home has become damaged, call the pros at Pristine Painting & Decorating to learn how you can fix the situation quickly and easily. Yet we all know that exterior painting is important for reasons above and beyond protecting your home. Your home’s exterior paint is the first thing that most people will notice about your home, and it can say a lot about your own personal style and preferences. A great coat of exterior paint will make your home “pop” and can greatly increase its curb appeal. By adding some style to your home’s exterior you can increase its resale value dramatically, and also protect your valuable investment. Now you know why it’s important to care for the exterior paint on your home, but what steps can you take to make sure the paint is in top shape? 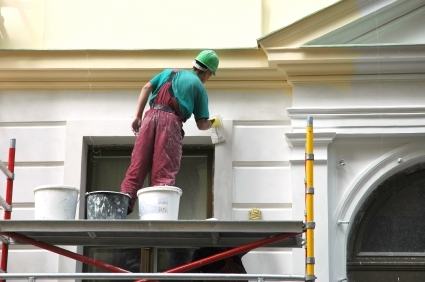 You could buy all of the costly equipment and spends long hours painting the exterior of your home yourself, or you could call in the professional house painters at Pristine Painting & Decorating. At Pristine Painting & Decorating we can save you time and money by putting our years of expertise to work for you. We’ll have your house in the best shape in years, and we’ll have it done fast! Call Pristine Painting & Decorating today to learn how we can help protect your home while also increasing its value! Contact Us at 630-546-5528 Now.